The Prehistoric Giant Terror Bird was known as the largest predatory bird to have ever lived. These Prehistoric Giant Flightless Birds had a height of 7ft. and weighed in at about 330 lbs. These extinct birds, of North America, arrived here by way of South America. Prehistoric Predatory Birds like these had powerful predatory feet and an enormous head and beak. They lived in open savanna scattered with oak trees. These gigantic prehistoric flightless birds lived in the Pliocene Period, of Florida, and were estimated to have gone extinct about 2 to 1 Million Years ago. Prehistoric Terror Birds ate small rodents, mammals, reptiles and carrion. It was estimated that it could run up to speeds of 40 mph (64km). Running its prey down and holding it with its huge feet and large claws, and using its axe-like beak to finish the job, was its mode of operation. Their 3ft. wings were useless for flight, but may have been better adapted as arms. Its hands had a similar structure to certain dinosaurs, like Velociraptor. Making their nest on the ground, they would have had gigantic eggs. Titanis walleri is one of the youngest species of the Family: Phorusrhacidae. Fossils of these large prehistoric birds of prey have been collected from a former sinkhole in the Santa Fe River, Gilchrist County, Florida. The fossil toe and foot bones were discovered by a scuba diver named Ben Waller in the 1960’s. 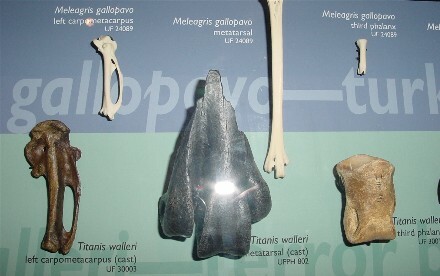 Another Titanis walleri bone was found in Citrus County, Florida. The only known fossils of this species have been found in Texas and Florida. The bones in Texas are dated over 5 Million years old, making its reign of Terror in North America about 5 Million Years. 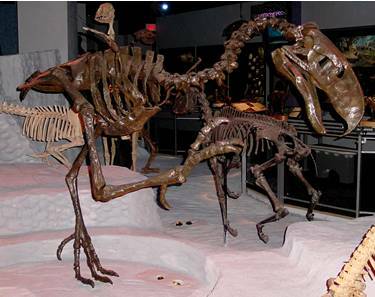 The fossils are so big that they are often thought to be large mammals, not birds, and sometimes go unidentified. In a time when the dominate predators were mammals, it is interesting that these large, carnivorous, flightless birds may have played a role as an apex predator.